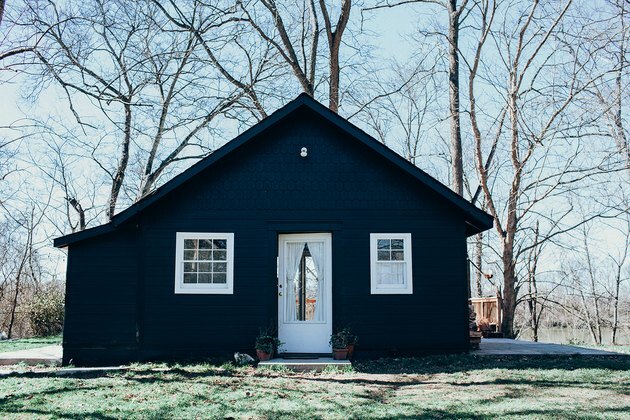 While many people move to the country for more space, Jessie Pickren and Tristan Warner found their ideal retreat in a 400-square-foot cottage. 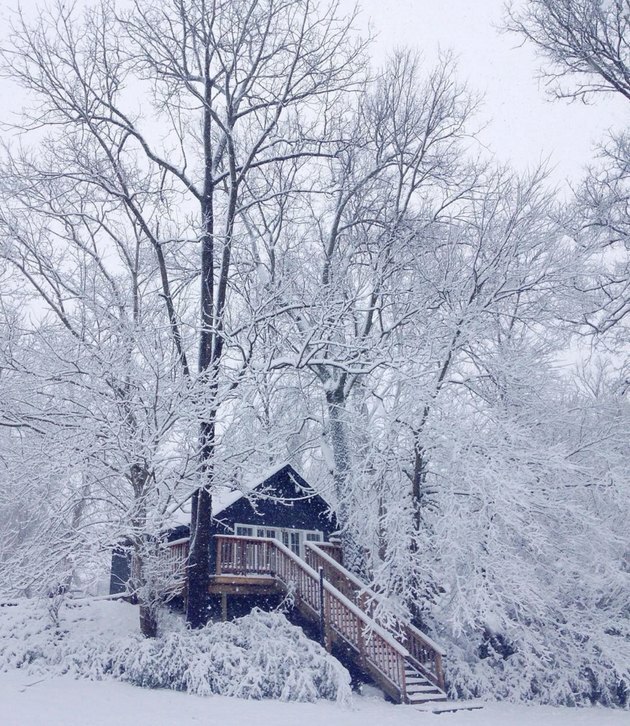 But when the couple and their three cats, Donnie, Tina and Pinch, moved south from Brooklyn to the home on the Cumberland River in Madison, Tennessee, just north of Nashville, it was in need of some major TLC. Warner is a general contractor and carpenter and Pickren is an illustrator and runs the design firm Hew and Company, so they were well equipped to tackle the project themselves. "We let the simple gable-end building guide us with typical farmhouse style trim outside and some craftsman style treatments inside," says Pickren. 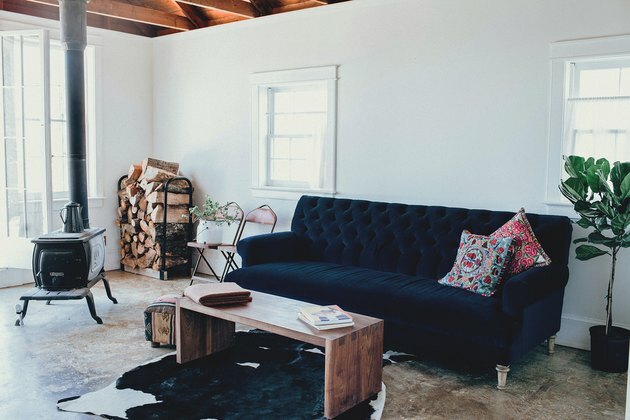 The cottage had to do double duty as their home and Pickren's design studio, so storage — and the ability to hide the bed away — was essential. "I needed to be able to have clients over and them not know they were in our bedroom," Pickren says. 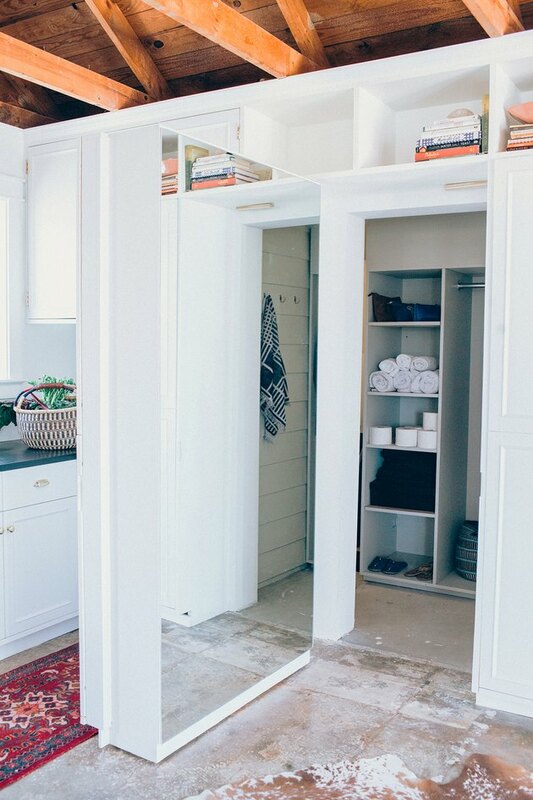 Warner designed a wall of storage that conceals the Murphy bed and the shower and makes the space feel polished. Warner also reframed the exterior walls to accommodate architectural salvaged windows and doors, including French doors from Pickren's grandparents home in Atlanta. The process was not without challenges — Pickren notes that they didn't have power for the first year — but the end product was certainly worth all the hard work. The cottage is set on the edge of the four-acre property. The exterior was painted in Sherwin-Williams' Tricorn Black. 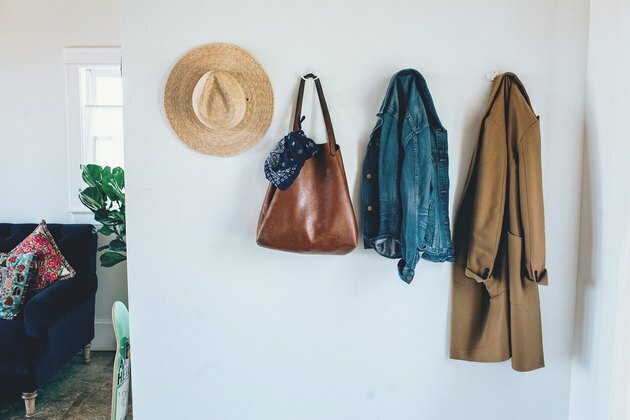 Simple hooks line the entryway and keep jackets and bags right at hand. The space is filled with unique finds and handmade pieces, including antique folding chairs that belonged to Pickren's grandmother and a walnut coffee table custom-made by Warner. 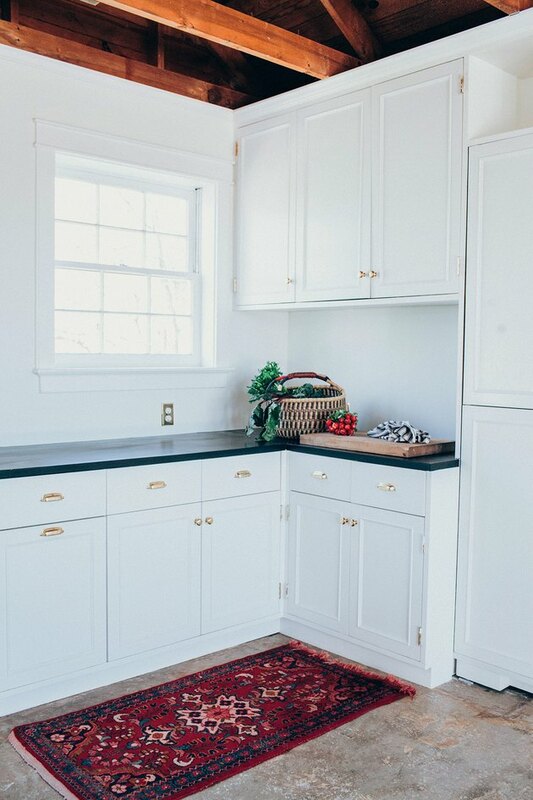 The cabinets were custom-designed with brass handles, hinges, and pulls. "We wanted something a little more classic and less austere than the customary flush cabinet door and concealed Euro hinge." 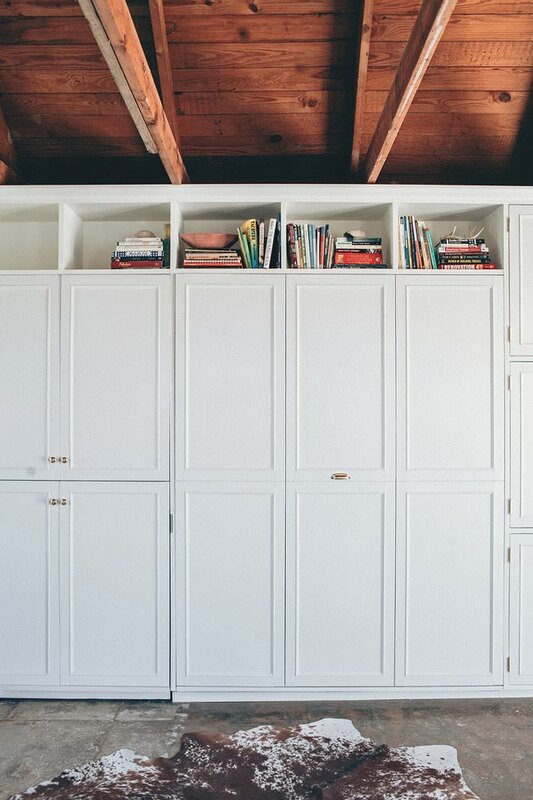 Warner designed a wall of cabinetry that contains a Murphy bed and plenty of storage. A drop ceiling was removed to expose the wood beams. The new wall of south-facing windows and French doors brightens up the cottage. 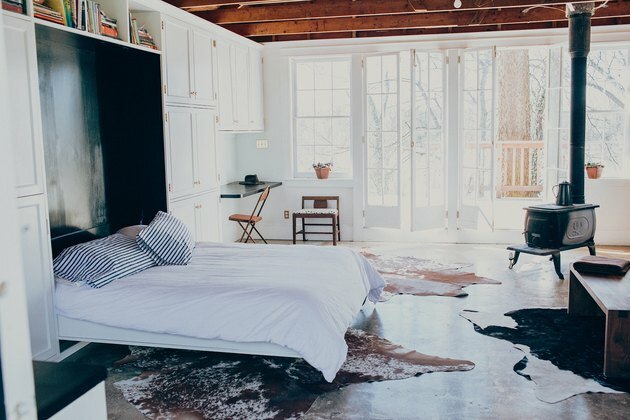 The stripped and polished concrete floors are topped with cowhide rugs from Scott's Antique Market in Atlanta. The shower is also hidden behind the living room's custom cabinetry. 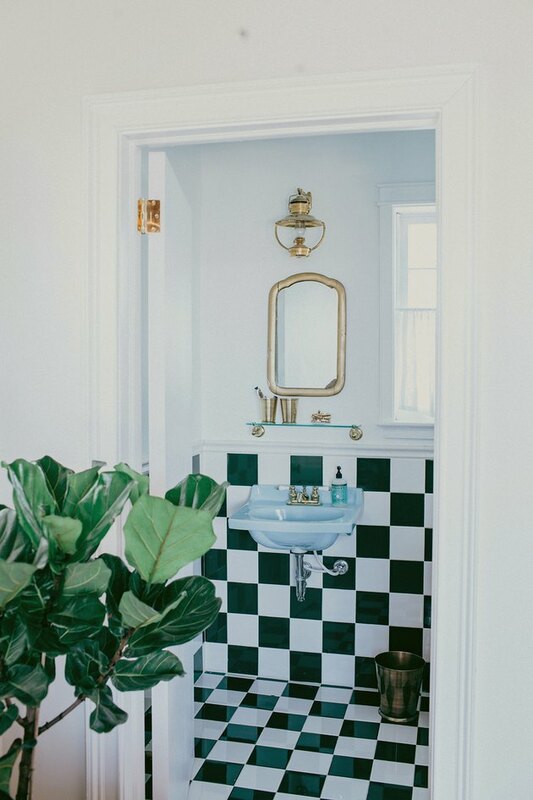 The bathroom is lined with square tiles in a checkerboard pattern. The couple added brass accents including the hurricane oil lamp from Vermont Lanterns and the faucet by Kingston Brass.